Each week, you will automatically get email for each of your projects with an overview of all developments in the past week. This will give you as a project manager an up-to-date view and a sound grip on your projects. The forecast budget variance will predict the budget result at completion of the project. De forecast is based on all activities of the project and the progress reported to those activities. The forecast is calculated by our advanced algorithm. It even gives you a best estimate in case the actuals spent hours are not available. The snapshot also tells you if the variance is increasing or decreasing compared to the previous week. 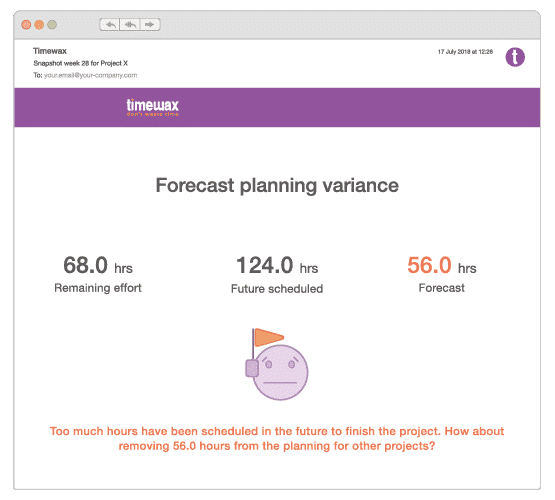 The forecast planning variance will tell you, if you have scheduled sufficient hours in the future resource planning to complete the project. This variance is also calculated based on the progress on the activity level. 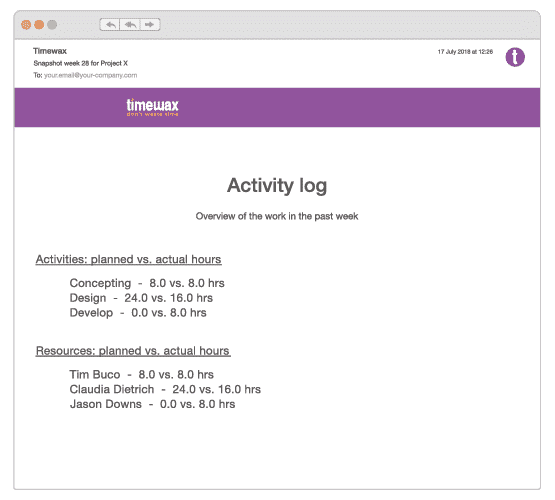 This way, as a projectmanager you can directly take action if you’re falling short, but also if you have scheduled too many hours redundantly. These hours can be reallocated for the benefit of other projects and activities. We calculate how your project is progressing, based on the reported progress on the activity level and weighed by their budgeted hours. 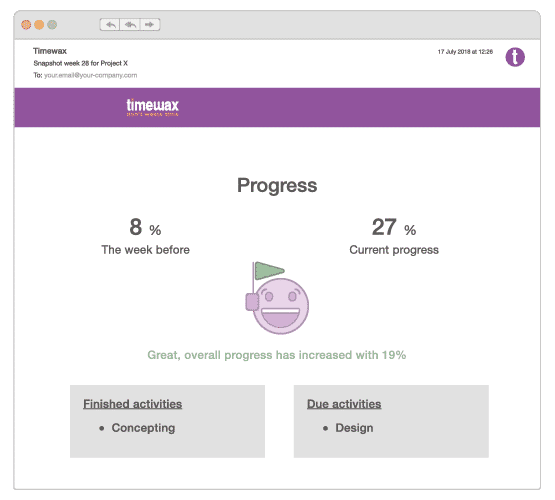 The progress is expressed in a percentage and is compared with the progress in the previous week. The snapshot will also list the activities that have been completed in the last week and which activities should have been completed. These activities are now due and require attention. The snapshot will also tell you which employees have been working on which activities in the past week. For each activity and employee, the total number of planned and actual spent hours are reported. This way, the project manager will get an idea of variances between actuals spent hours compared to what he planned the employees to do. This is only available in the Plus edition. The Plan edition will only show planned hours. 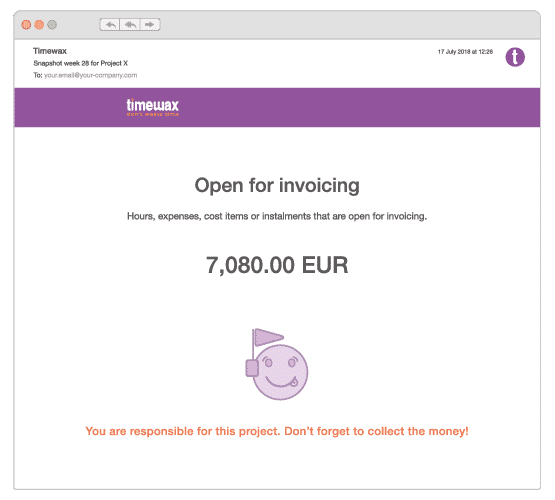 The last section of the snapshot will tell you the amount that is open for invoicing to the client. This amount includes hours (e.g. time material, fixed price), cost items, expenses and instalments. This way, the project manager will have an instant insight in the amount due. This can be actionable information to start invoicing the client. 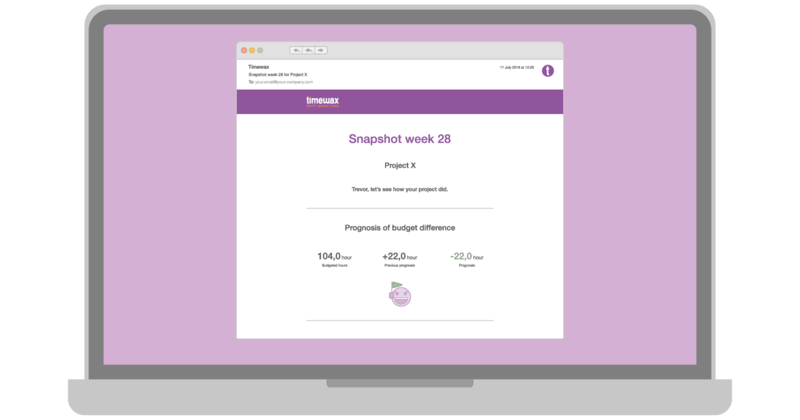 Do you want to see the Project snapshot in action?